Choose a strong dog collar for Neapolitan Mastiff of 1.4 in wide leather with a classic buckle. Sizes: 14-40 in. Colors: black, brown, tan. 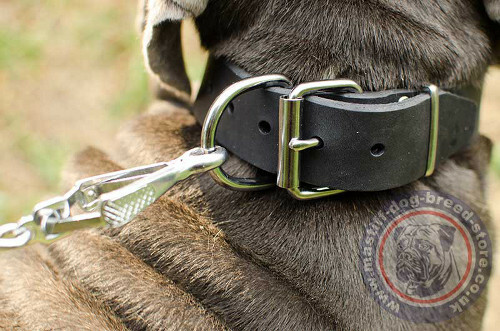 Strong Dog Collar for Powerful Neapolitan Mastiff, 1.6 In Leather! 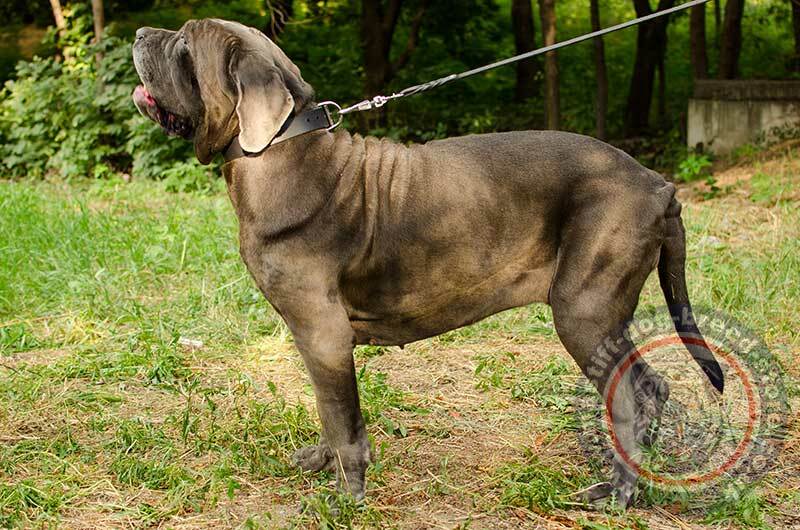 Neapolitan Mastiff dog breed representatives are large, powerful, muscular dogs. They are perfect family guard dogs if trained and socialized properly. Neapolitan Mastiff training requires patience and consistency. Of couse, to handle and keep a large Neapolitan Mastiff under control, you will need a strong dog collar. 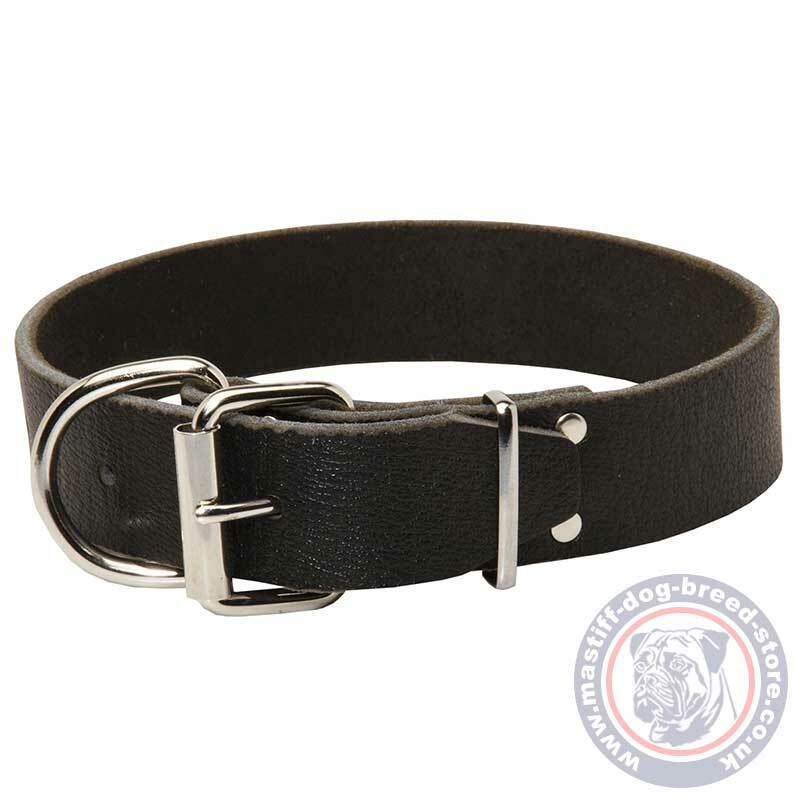 We propose to choose a wide dog collar made of 1.6 in leather strap and supplied with a strong buckle and ring. 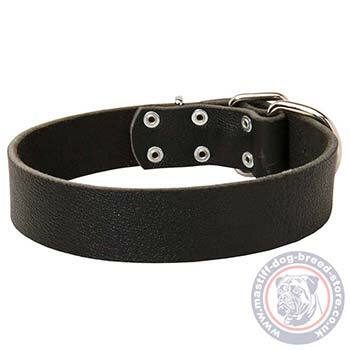 This wide dog collar is well-done, handmade and reliably fastened. Classic design of this strong dog collar is a perfect choice for Neapolitan Mastiff reliable control in walking and training. Wide leather collar does not hurt or rub dog's neck. Choose this strong dog collar to get comfort, reliability and control over your dog at the same time. Strogn dog collar looks perfectly on Neapolitan Mastiff! Neapolitan Mastiff Looks and Feels Gorgeous with Wide Leather Dog Collar! It is important to make the proper measurements to choose the right collar size. The leather collar will serve you for a long time, if stored properly. Please, follow simple rules of leather collar service: - do not expose the product to straight, excessive sun rays, water or moister contact - buy special leather sprays, creams and water repellents to prevent leather getting dry and cracked.